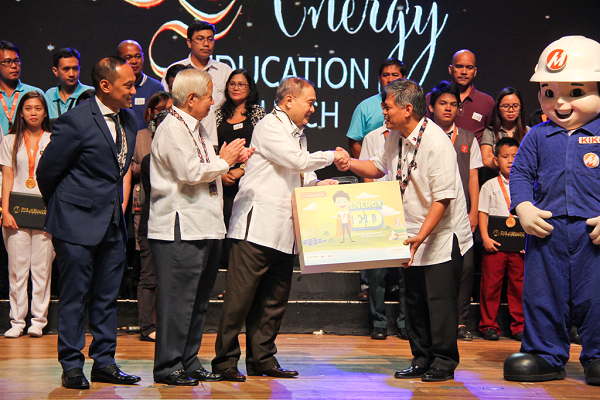 Meralco Chairman Manuel V. Pangilinan, together with Meralco President & CEO Oscar S. Reyes (second from left) and One Meralco Foundation President Jeffrey O. Tarayao (far left), turn over an energy education learning kit called “Energy Ed” to Department of Education Secretary Bro. Armin Luistro during One Meralco Foundation’s “The Power of Dreams” event at the Meralco Theater. “Energy Ed” was designed to help teachers easily incorporate energy concepts in classroom instructions. It was developed in partnership with the Coalition for Better Education (CBE) and 37 teacher-authors from various public schools around the country. Each kit consists of knowledge, project-based learning and activity cards which may be used in the K-12’s STEM (Science, Technology, Engineering, Math) academic track. “Energy Ed” is part of One Meralco Foundation’s Energy Education Program which seeks to educate the youth about energy – how it is harnessed and conserved -- so that they become responsible energy consumers. DepEd’s Luistro also recognized the potential of the energy cards as a learning tool for schools displaced by disasters, as these can be utilized for both classroom & informal set-up. “Energy Ed” will be made available in both printed format (packaged in an easy-to-carry box), and downloadable version via the program’s website www.energyed.ph.